The last couple of weeks I was not in the frame of mind for the regular extreme metal intake, so whenever I wasn’t listening to all-too-familiar and memorized-to-the-last-note old album favorites, the inner self wanted to continue searching outside of the envelope from drone/sludge to 80s hard rock to, lastly, European darkwave. German Hekate, the band I knew nothing about, are represented by the sublabel of Prophecy Productions, the place you absolutely need to turn to when in need for eerie emotional music. 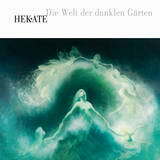 Die Welt Der Dunklen Garten is the first new release from Hekate in seven years, but for me it may as well have been a debut. Also, the band’s style is classified as neofolk, whatever that means, but for me this is what darkwave sounds like, a cold detached synthesizer laden blend of gothic, classical and melancholic music, albeit with obvious folk references in Hekate’s case. Somehow such music always struck me as stuck up, aristocratic, exquisite and mostly emanating from European shores, but it always serves as a soothing background for a brooding soul. Originated by The Cure and Depeche Mode, perpetuated by Fields of the Nephilim, and making appearances stateside with Aesma Daeva and Autumn Leaves, darkwave took gothic music and transitioned it from pop-rock influences to classically oriented private affairs. Hekate on Die Welt Der Dunklen Garten, equipped with Lord Byron lyrics on Byronic Hero and other classical poetry on Opportunity of Time and Die Blaue Blume, very much tend to remain in the private self-isolated corner. At the same time, Hekate take a listener on a trip around the world with this album. Jardin d’Anais is French chanson with whispery or ringing female vocals, rural motif and pastoral harmonica. Seelenreise presents vocalist Susanne Grosche as a German version of Ofra Haza, the sitar making the song sounding authentically mid-Eastern. Sanctus takes place in a Lacrimosa painted medieval gothic cathedral, male choir chanting a single phrase repeatedly. Die Dunkle Wolke is bagpipe dominated and if you try splitting hairs pretty hard, perhaps the melody of Herr Mannelig comes to mind. The ominous drum beating Per Aspera ad Astra and percussive catchy Idilia Dubb hint at tribal African rhythms. The Present Day is an equal opportunity Arabian Desert and Swiss mountains. Oh du Welt der Dunklen Garten and Opportunity of Time are less geographically specific and can take place in a mystic forest whatever the exact continent and locale. Neofolk or not, Hekate allows for daydreaming and mesmerizing beauty, providing a listener with an insulating layer of Teflon-like skin, putting him/her in a cocoon, to which the troubles of reality don’t stick as much. This is all helpful and very enjoyable when you are in a mood to drift.